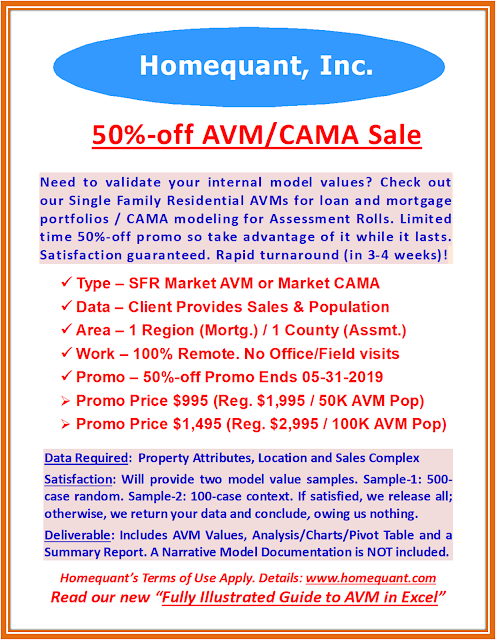 Homequant : Level-2 Market Analyses -- 25 Major Markets -- Free -- No Registration! Level-2 Market Analyses -- 25 Major Markets -- Free -- No Registration! a. Level-1: Parcel-level (Sold) data crunch; Analysis of Median Sale Price and Normalized Median Sale Price per SF (SPSF) by month and market (we call it Champ-Challenger analysis); Market Type=Major City (ex: Miami) or County (Orange County, CA). We do not roll up our analysis to the MSA level. b. Level-2: As above, plus Trend analysis. We apply two trendlines: primary (linear, logarithmic, polynomial, etc. depending on the actual data trend) and 2-Mo. Moving Average to show a slightly smoother line by ironing out monthly median aberrations. c. Level-3: Sales Ratio (Time-adjusted Sale Price to County Market Value as per tax roll) is available on our TownAnalyst site. In fact, it offers an expanded percentile distribution analysis. It is totally self-directed, thus empowering users to experiment with their own time coefficients (positive or negative) and valuation dates (current, forward or backward). As we have indicated, our Champ-Challenger analysis is more meaningful than the unchallenged single variable analysis, considering ours offers insights into the market internals as well for more informed business decisions. We keep our analysis at the local level, instead of rolling it up to the MSA level, which is too large of a geo-node to be a meaningful basis for any informed decision-making. In any case, most people can relate to and appreciate the local level analysis than the broad-based MSA’s. Our trendlines allow us to extract the equations on-the-fly (from our stored procedures) and apply them on to clients’ datasets (we generally offer these free updates as a standard service). FYI New Analysts – Try this approach, to avoid having to redevelop the study over and over. Once you get the new data (monthly or quarterly), just point to the update and refresh. In Q1-2019, we will introduce Level-4 analysis. It will comprise Sales AVM (Challenger Model) values. In addition to being part of our future market analysis, this value will be available inside Homequant as an optional comp value (5th comp). In TownAnalyst, this value will help define AVM Ratios (ASP to Sales AVM and County MV to Sales AVM), aiding homeowners and appeal consultants to get a more surgical view of assessment inequity on the tax roll. In our next go around, we will cover other major markets like Austin, Cleveland, DC, Fairfax, Indianapolis, Kansas City, Milwaukee, Pittsburg, Salt Lake City, San Francisco, etc.